If you are looking for an evening of jammed-packed heavy metal, well look no further! 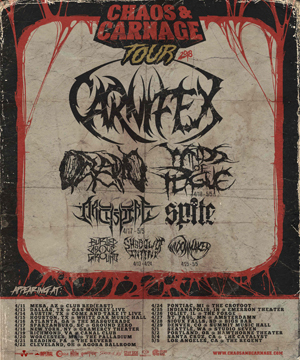 The official line-up for the inaugural “Chaos And Carnage” tour features a dynamic and very exciting plethora of such genre defying artists as CARNIFEX and OCEANO, alongside such perennial metal bands as ARCHSPIRE and WINDS OF PLAGUE. However, there are also a killer batch of younger, up-and-comers, such as BURIED ABOVE GROUND, SHADOW OF INTENT, SPITE and WIDOWMAKER to round-out this already stellar bill. It’s all here and there’s something for everyone spanning the entire metal spectrum, all for a very affordable price. This is a tour for the fans and the first must-see event of 2018! For all tour-dates either see below or visit www.chaosandcarnage.com. Don’t miss out! Scott (CARNIFEX Vocalist) states: This is our ONLY tour across the U.S. this year and we are excited to bring our biggest headlining show ever to the first annual ‘Chaos And Carnage’ tour. We are going to play some songs we never played live before and are ready to smash it with our heaviest set yet! Get off your asses and come party with us. It’s going to be a night to remember! See you all soon."